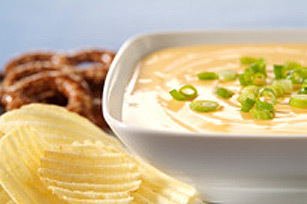 Beer gives this two-ingredient cheese dip its pub-inspired zip. Served with pretzels or chips, it makes a quick and easy last-minute appetizer. Microwave Cheez Whiz in medium microwaveable bowl on MEDIUM 5 min. or until Cheez Whiz is melted, stirring after 3 min. Stir in beer until well blended. Garnish with green onion slices just before serving. Serve with pretzels or chips.